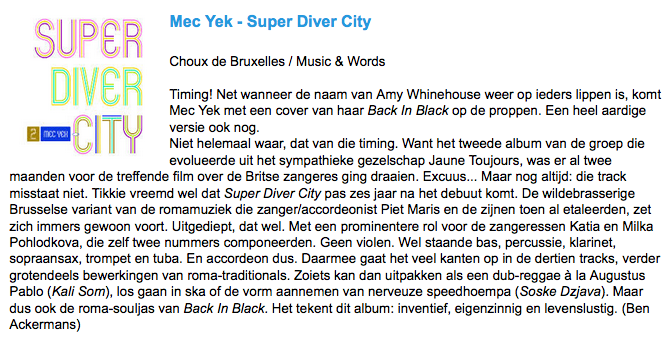 Sarah Baur made a new clip for Mec Yek: Pale Tsha Kalo is a tribute to Amy Winehouse, as recorded on the latest album SuperDiverCity. With the clip, Mec Yek takes part in a contest organised by the Amy Winehouse Foundation (Foundation working to prevent the effects of drug and alcohol misuse on young people). You can watch the brand new clip by clicking the image above. Ton Maas from Mixedworldmusic.com went to the Glatt und Verkehrt festival in Austria and couldn’t resist shaking his hip to the stomping sound of Mec Yek. You can read his report (in Dutch) by clicking the image below or on the Mixedworldmusic.com website. Choux de Bruxelles kreeg onlangs positief artistiek advies voor de cultuursubsidies van de Vlaamse Gemeenschap voor de komende vijf jaar. Fingers crossed (de beslissing is voor juni 2016)! Politica Khadija Zamouri (Open VLD) over de noodzaak van overheidssteun aan een kleine Brusselse organisatie als Choux de Bruxelles. Roma Days / Way 2 Roma is a collaboration with De Centrale, Bij de Vieze Gasten and Roma Platform Ghent, an extention of the annual International Roma Day (april 8). Way 2 Roma takes place for the third time in 2016, including concerts, performances and workshops, all about Roma and Roma culture. 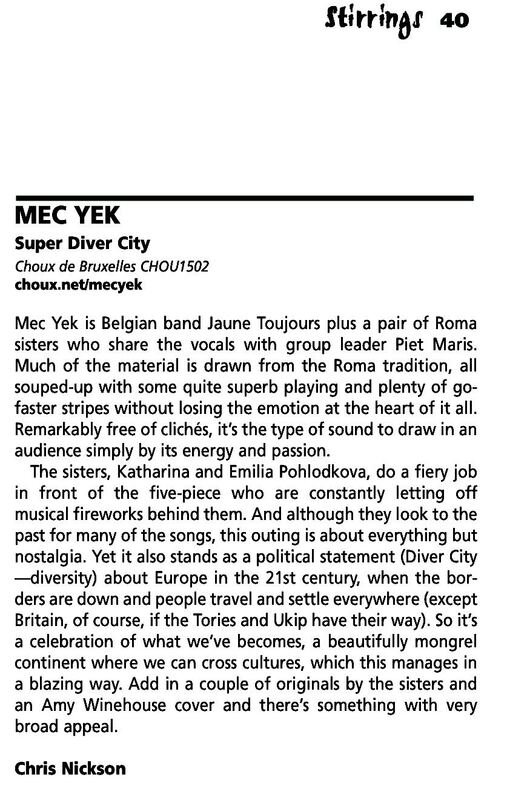 Songlines gave Super Diver City a four star review in their Top Of The World section! 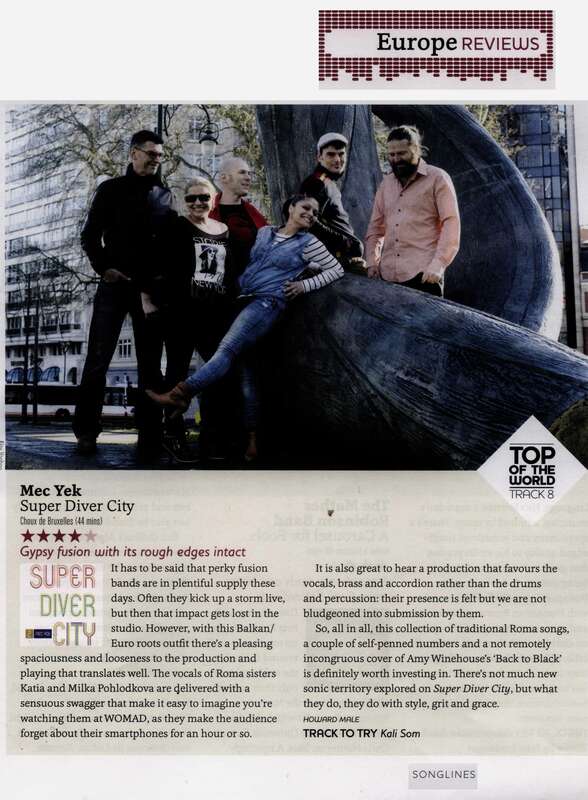 Super Diver City just got reviewed in Stirrings magazine – click the image below to read it! 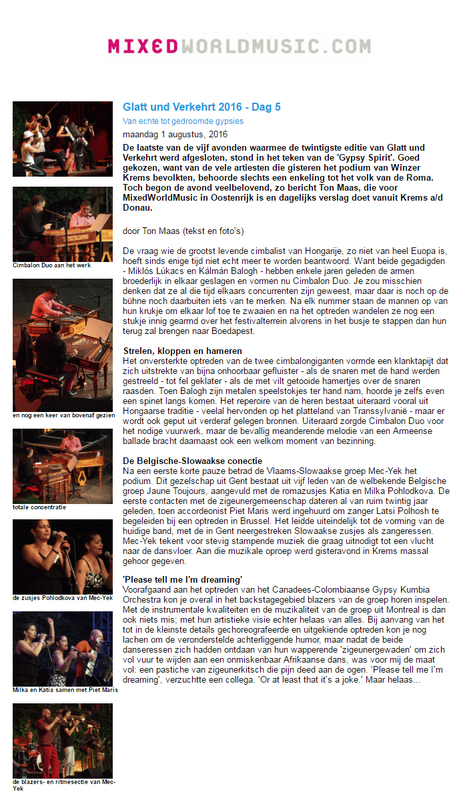 Read the full article (in Dutch) by clicking the image below, or go to the MixedWorldMusic site by clicking here. In French this time! Click the image below to read the full review! Click the image below to read the full review (in French) below!